A detail from an illustration by Sir John Tenniel depicting Alice with the March Hare, Hatter and Dormouse at the Mad Tea Party. From Alice’s Adventures in Wonderland by Lewis Carroll. To quote another famous character, a certain Jeff Coutelou, during these last few months there was no proper autumn, no real winter, no true springtime. The last few months of 2015 and early 2016 were abnormally warm, not one single day of frost in Puimisson. Plant life started very early, there was blossom on trees in February, mimosa everywhere. People recorded their vines starting to ‘cry’ as the sap rose. And then, it all stopped. As March and April unfolded the weather was chilly with cold northerly winds. The plant life closed down its growth to a minimum. Budding (ébourgeonnage) was late even after the mild winter. May is usually warm in the Languedoc and we have had some hot, sunny days but interspersed with cooler days and plenty with a lot of cloud cover. 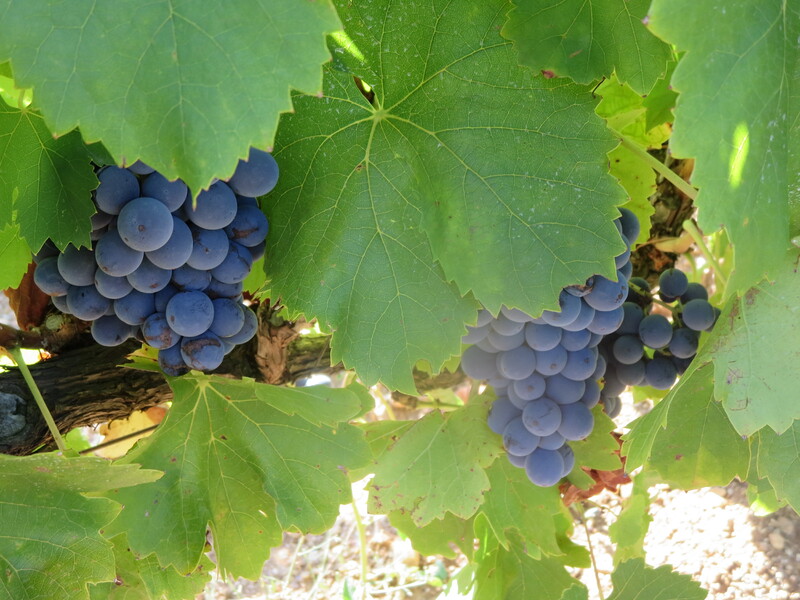 The vines pushed quickly some days, 25 – 30 cm the week before last and then… cooler weather slowed the growth again. Flowering (fleuraison) began last year around May 5th but this year Jeff and I spotted the first flowering on May 26th. Appropriately that was in the Flower Power vineyard, Font D’Oulette. 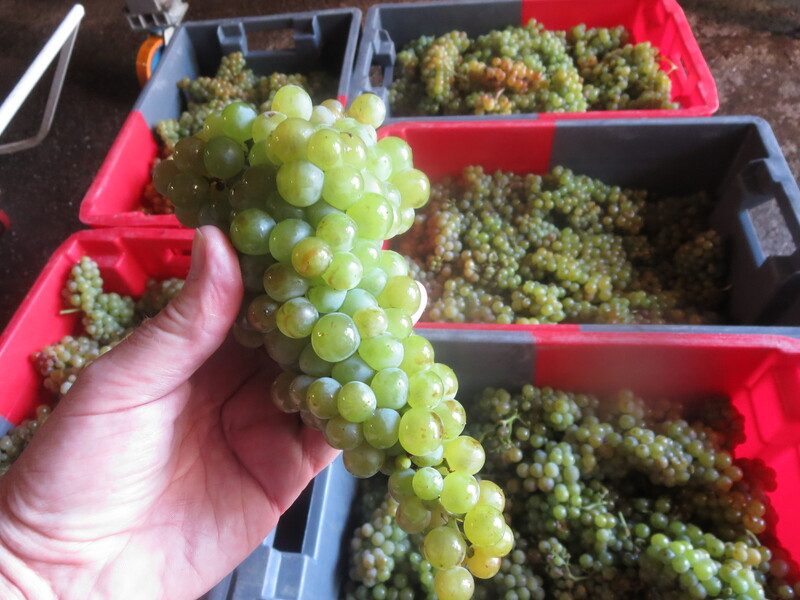 Yet in the white grape vines, such as the Muscat in Peilhan, there is no flowering. It is likely that most of the vines will flower at the beginning of next week, most varieties at the same time which is, again, most unusual. Curiouser and curiouser. 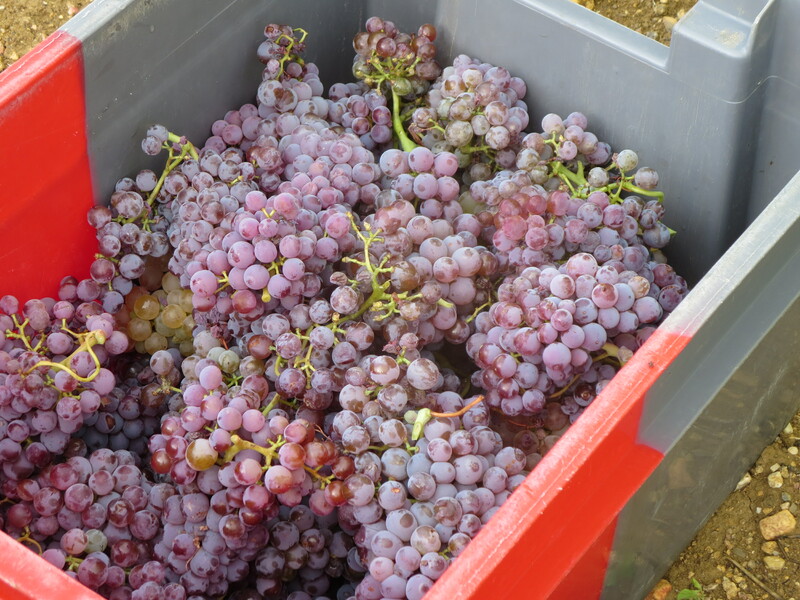 As the vendanges are calculated at 100 days after flowering, the likely date for harvest to get under way is now well into September, ie 10 – 14 days behind 2015. After a very precocious start to the year! So why does this matter? Well, the vines have been unable to rest since last harvest. The lack of frost or cold weather in winter meant that the vines did not shut down fully. The sap has been on the move for months. Those early reports of vines crying in February, then delayed growth. Vines have sent out a lot of growth but the lack of sunshine has not produced much photosynthesis, the vines are often green in lower parts but lighter green higher up. 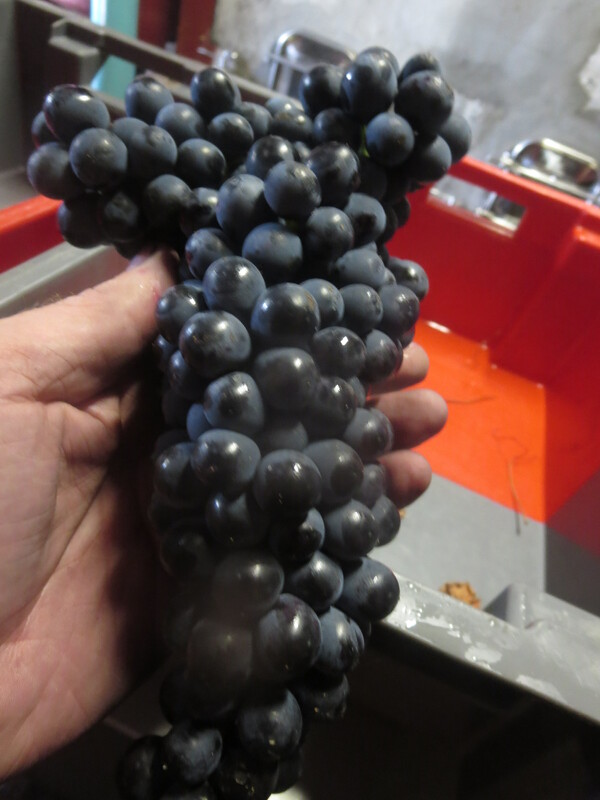 The grafted vines in Font D’Oulette have been slow to send out growth, the sap flows and then cooler weather arrives. Humidity and grey clouds means a threat of mildew and some spots are evident on leaves in certain parcels. Jeff spent the night of May 20 spraying from 9pm to 1am, starting over again at 6am the next day. Why then? During the night and early morning the vines are more receptive to the influence of the spray as the pores are open in cooler temperatures. Not the usual spray of course. 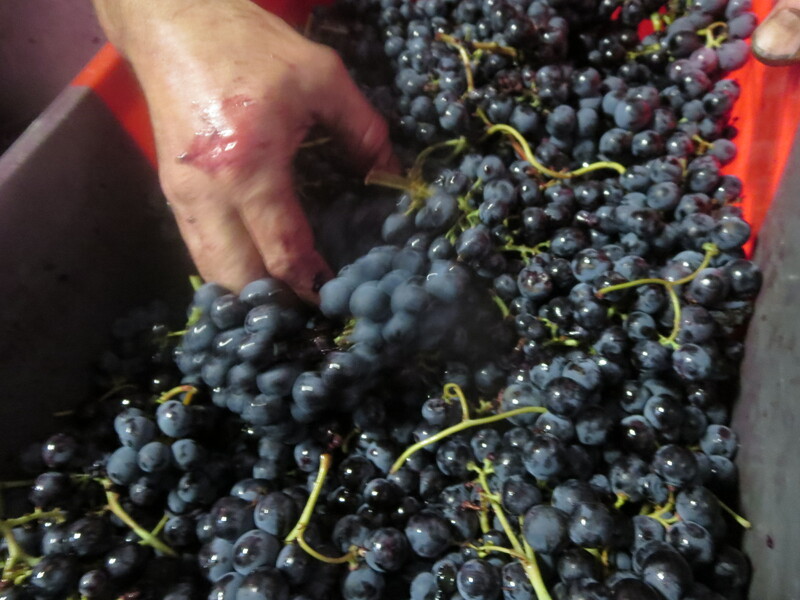 Mas Coutelou has been organic since 1987 and Jeff has gone much further. This spray was of nettles, horsetail, seaweed mixed with a tiny amount of sulphur and copper (allowed in organic farming). And also in that mix were essential oils of sweet orange and rosemary, pampered vines indeed. This prompt action has mastered the problem supported by timely sunshine and northerly winds. Whilst in Rome vineyard the other day we looked at the soils and Jeff pointed out the growth of good mushrooms and fungal life in there. The photos show this life, the white spots. Scientific research shows that it is through fungal life such as this that the vines communicate with each other and support each other. This has taken a lot of soil nurturing and management. And to further demonstrate the health of the vineyards, remember the vandalism of the Carignan vineyard and the flowers that were planted there? Well they are growing back stronger than ever. Nature wins in the end. We can only choose to support it or fight it, but in the end nature will win. At present despite this most curious of years the vines are in good health. 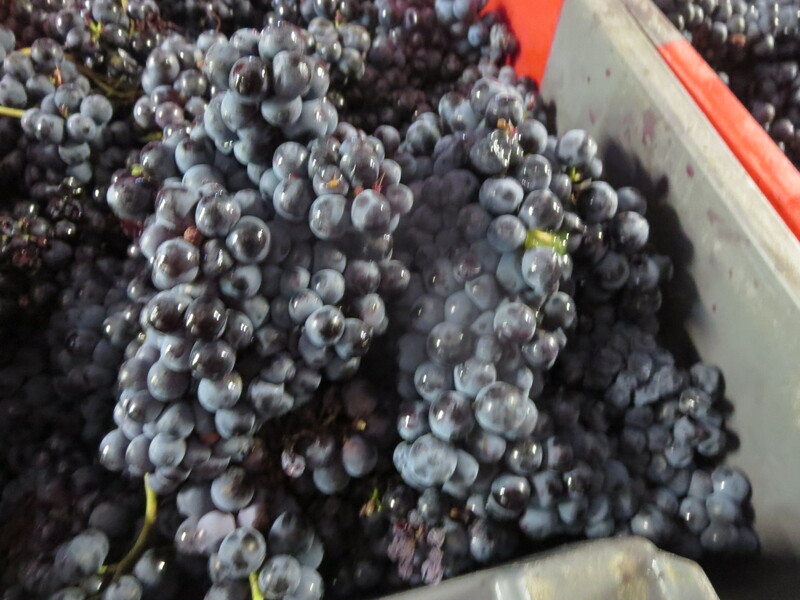 The next three months will decide whether the grapes will be of good quality or not. 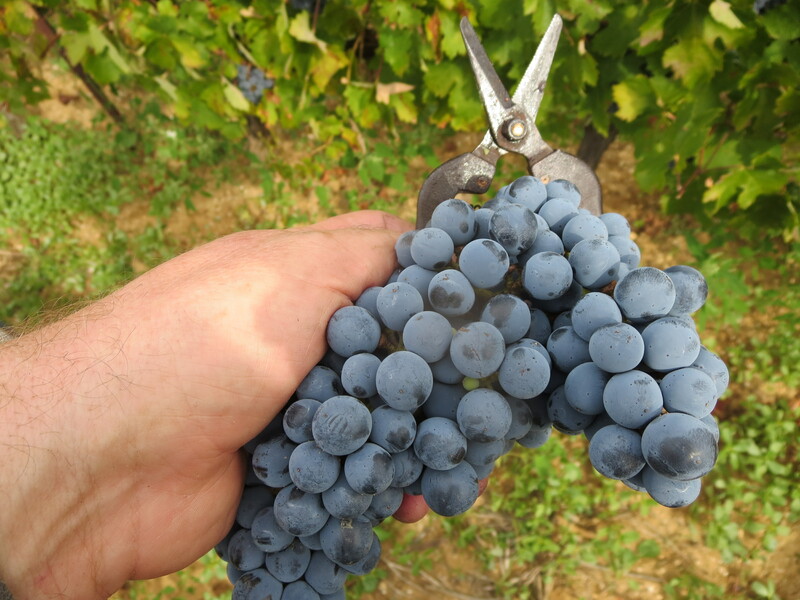 Jeff reckons that the period from April 15 to July 15 the vigneron must be always present, always monitoring the vines to ensure that any problems can be sorted as soon as possible. That will make or break the vintage. Meanwhile we have been treated to some beautiful flowers in the wild and around the vineyards. As well as birdsong in Rome vineyard. Nature at its best despite the curious year. That is if the problems can be solved. 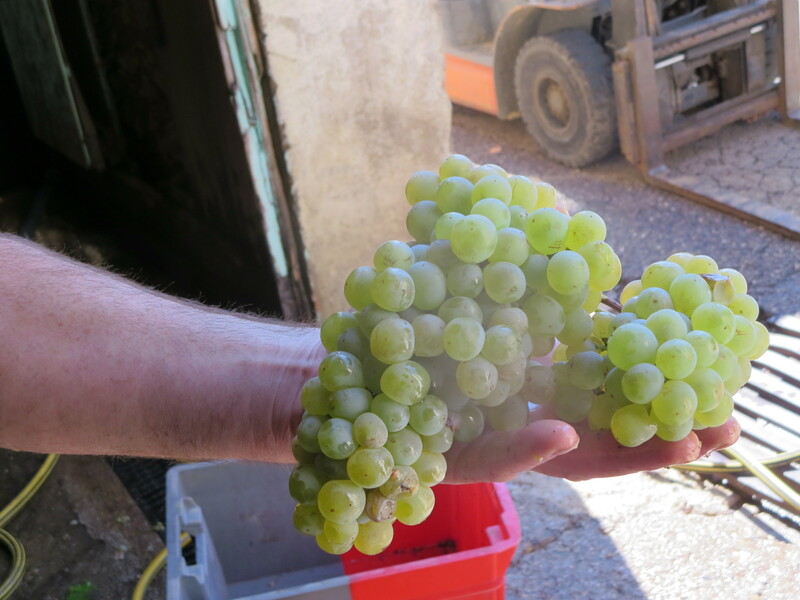 Just this week Sancerre and Burgundy were hit by massive hail storms causing damage which means that the year is a write off in some vineyards. The third such storm this year in some of these areas. And on Saturday, May 28th Beaujolais was badly hit too. Again nature decides. A curious year, yes. But a disastrous one for some. * (No rude comments about mad March please). Categories: Vignerons, Vines | Tags: ébourgeonnage, fleuraison, Flower Power, Font D' Oulette, horsetail, Mas Coutelou, mildew, mildiou, nettles, Puimisson, pulverisation, Rec D'Oulette, Rome, vine spray, vineyards | Permalink. Snails and vandals aside there have been plenty of positives at Mas Coutelou in recent weeks, not least in the cellar. The beams in the photograph below have been strengthened with iron as some of the wood beams were no longer in contact with the wall! We saw recently the removal of the large, old press which used to dominate the top end of the cellar next to the cement tanks. Jeff has also removed a huge fibre glass tank which took up a lot of space. 145 hectolitres in size, it was now redundant as Jeff prefers to use smaller tanks for fermentation and maturation. Incidentally 145hl is almost 20,000 bottles of wine! The photograph shows the number of doors in the cement tanks which have been divided to allow smaller amounts of wine. These two empty spaces now leave much more room in the cellar for all the machinery needed, during the vendanges for example. Jeff told me that the cellar had taken shape in 1956 so these are the first major changes in 60 years. The floor has also been renovated with drains updated too. The surface you see in the photos from last week will be covered with resin, more practical in a wine cellar. One of the more popular cuvées has also been the focus of work. Bibonade is a sparkling wine, white and rosé. This PetNat style is very refreshing but requires work just as any sparkling wine. The fermentation in the bottle creates some residue which needs to be removed. The residue can be seen in the neck of the bottle as they are placed in these wooden frames known as pupitres (desks). Once the lees have gathered next to the capsule the bottle is opened so that they explode out with the force of the carbon dioxide made from fermentation. The bottle is then topped up and resealed. Definitely a cuvée to enjoy, my wife’s favourite Coutelou wine for example. Categories: Vignerons, Wines | Tags: Bibonade, cuve, Mas Coutelou, pupitre | Permalink. Around 4pm this afternoon I received a text from Jeff to say that Rec D’Oulette, the vineyard of the Carignan of Flambadou had been vandalised. I had been in the nearby Flower Power parcel this morning but passed that parcel noticing nothing amiss. I was horrified to hear and then see the photos which Jeff published on Facebook. Someone has passed through the middle of the vineyard with a machine to cut the flowers and plants which Jeff had planted amongst the olive trees. These are designed to attract insects, bees and other biodiversity to the area. Surely a benefit for all vignerons and people? It is unbelievable that some pathetic individual or individuals see some twisted reason to destroy what is beneficial for the area and for vineyards. Jealousy? Who knows but they are wrong headed. And just wrong. Because Jeff will plant more. When someone cut down ten trees he had planted, he replanted ten. With another thousand for good measure. Flowers, plants will bloom again in Rec D’Oulette. These photos were taken a few weeks ago in the vineyard, wild and planted flowers will return. And though one, or even a few, may not like his work for some reason, the support shown to Jeff comes from thousands of people. Let one hundred flowers blossom.